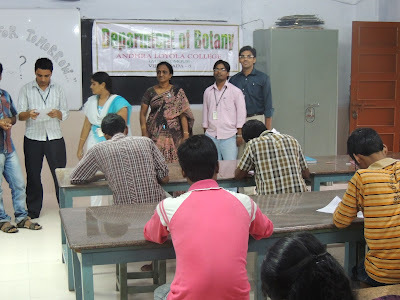 The Department of Botany organized a guest lecture on Regulation of Ecological Consequences for Sustainable Development on 22nd July, 2013, at 2.00 p.m at seminar hall. Dr. P. Bramhaji Rao Assistant Professor in Environmental Science, Acharya Nagarjuna University delivered his talk, he explained the importance environmental protection and impact of Global warming and other pollutants for the sustainable development of Ecological systems. The environmental awareness week ended with the prize distribution Dr. Vidya Kanna , Director of Jana Sikshana Samstan was the chief guest, she encouraged the students with her talk, she clearly explained the importance of the conservation of Natural resources. The dept of Botany organized Slogan Writing competitions on 20th July, on the given topic--- Need of the protection of Environment” about 200 students of all the depts, actively participated in this competition and expressed their ideas and insights. 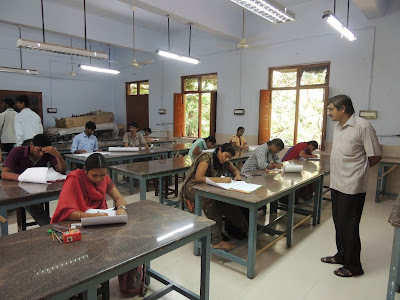 Dr. T. Rose Mary and Mr. P. Srinivasa Rao acted as Judges for this event. 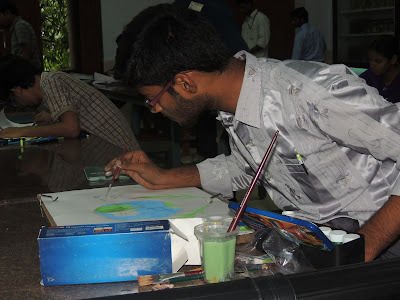 The dept of Botany organized Drawing competitions on 19th July, on the given topic---“ SAVE NATURE” about 50 students of all the depts, actively participated in this competition and expressed their ideas through colours. The Dept of Botany observing Environmental Awareness Week from 18th July to 22 July 2013 to create an awareness and to impart knowledge about the environment and its conservation aspects.An Environmental Awareness is important because it helps to spread environment education, especially in the non-formal system among different sections of the society. It also facilitates the development of education or training materials and aids in the official education area. On the eve of this, the Dept organized the following events. 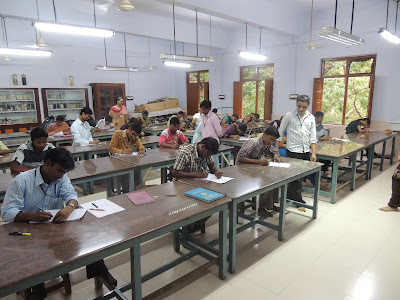 The Dept of Botany organized an Essay Writing competitions on 18th July, on the given topic---“EARTH FOR TOMORROW” about 100 students of all the Depts, actively participated in this competition and expressed their ideas and insights. Fr. P. Anil Kumar, Dr. B. Siva Kumari and Mr. K. Balachandra judged this event. 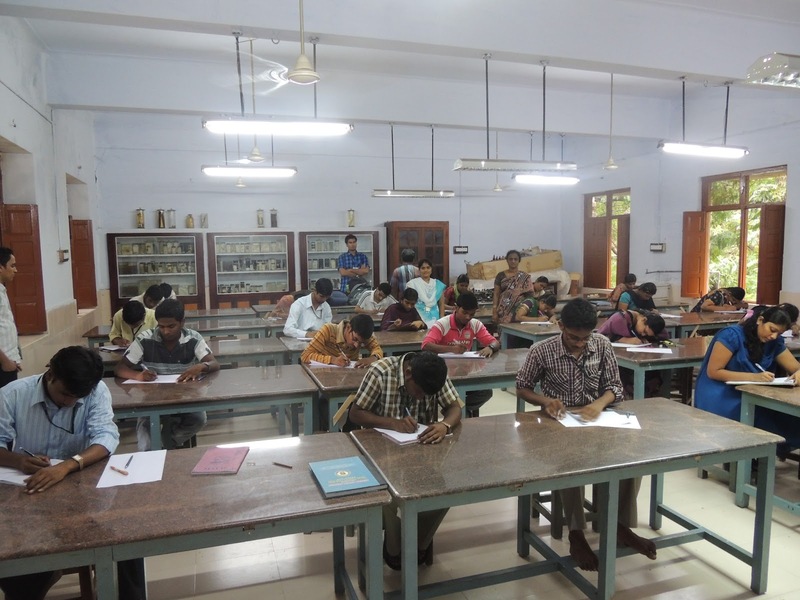 The Dept of Botany organized a Guest lecture on Career guidance for Biological students. 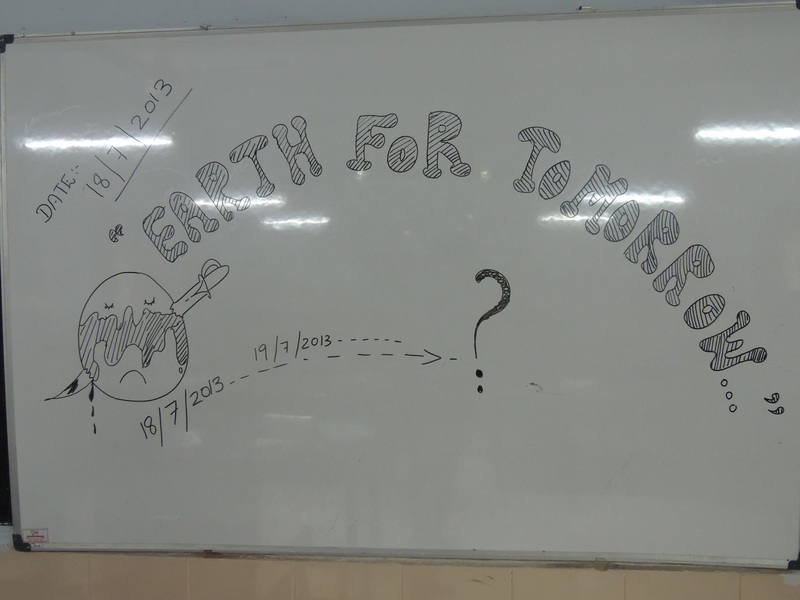 The program was organized on the 10th of July (Wednesday) 2013.Rev. Fr .G.A.P. Kishore, Principal of Andhra Loyola College, Rev. Fr. P. Anil Kumar, Vice- Principal, Dr. Mrs .B.Siva Kumari, Head of the Dept Botany, Mr.K. 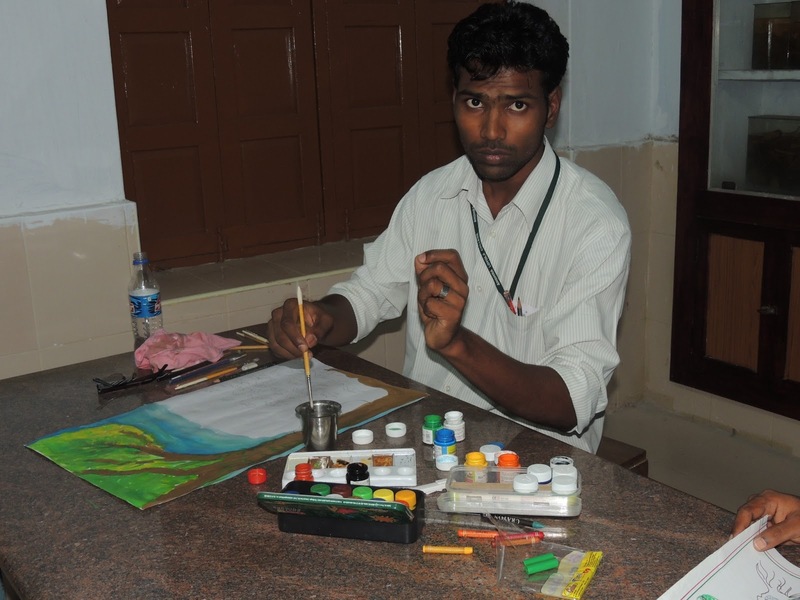 Bala Chandra ,Head of the Dept Microbiology. Staff members of the Dept, all the students of Biology section especially the freshers attended the session.The Guest Lecture was delivered by Dr.V. Naga Lakshmi, Director, IMIS Pharmaceuticals, Vijayawada. The program started with a prayer song by Degree (3rd B.Sc) students followed by Welcome Speech by Mr. Balachandra, Head of the Dept. Microbiology .Fr. P. Anil Kumar addressed the gathering with his inspiring speech regarding the future of students .He praised the Dept for organizing such innovative program. He also spoke about achievement of various goals for career development. Dr.V.Naga Lakshmi, Director, IMIS Pharmaceuticals, was invited as the Guest speaker for the program. She nicely motivated the students regarding their future aspects in Biology. 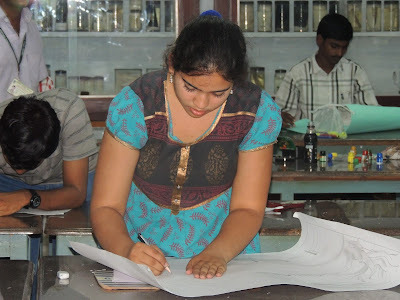 she exclaimed that there is drastic downfall of students pursuing Biology / Life sciences. This is mainly due to lack of awareness among the students as well as parents regarding Life science courses. Madam explained the importance of medicinal plants, Nursery maintenance Green house, Landscaping, etc as part of the career guidance and development. She also motivated the students regarding the current research activities and shared her inspiring and thought creating experiences. She concluded her speech by motivating the students towards UGC projects, Pharma and drug industries and created awareness among the students for their career development. All the students participated enthusiastically till the end of the program and finally it was knowledge giving, encouraging and thought evoking theme for all the upcoming life science graduates. The program ended with vote of thanks by Tony of final B.Sc.